In the world of Sweet Oak, stylish squirrels don jaunty acorn cap berets. Striped inchworms measure leaves and nibble on a few on their way to getting wings. Delicate fields of clover invite visitors to stop awhile and look for luck, which abounds in this joyful feast for the imagination. Sweet Oak is a playful and sophisticated mix-and-match-able collection, a fresh take on a classic primary palette with a modern Scandinavian flair. Perfect for gender-neutral quilting and sewing projects, these fresh designs will delight both children and adults! 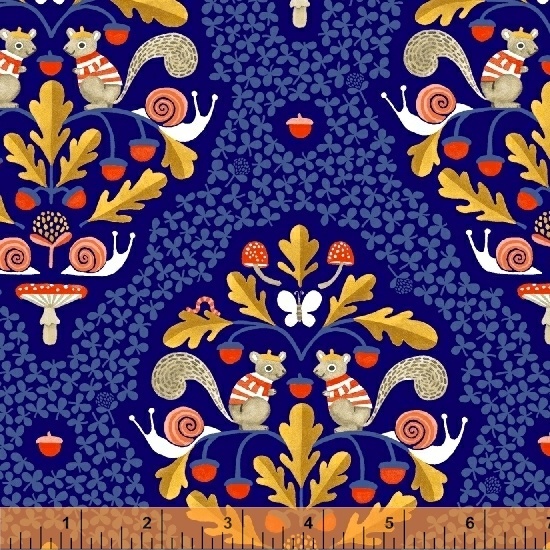 These patterns easily go together for use in home decor, apparel, quilts, cushions, curtains, toys, and more. Let your imagination run wild through the fields and forests of Sweet Oak! Sweet Oak is made with G.O.T.S. Certified Organic Cotton. Collection is used in the Nuttin to Hide Quilt Kit. On Sale: January 2019. Ships: July 2019. 26 skus.